Researchers at Columbia Engineering announced today in Nature that they have built a Kerr frequency comb generator that, for the first time, integrates the laser together with the microresonator, significantly shrinking the system's size and power requirements. They designed the laser so that half of the laser cavity is based on a semiconductor waveguide section with high optical gain, while the other half is based on waveguides, made of silicon nitride, a very low-loss material. Their results showed that they no longer need to connect separate devices in the lab using fiber—they can now integrate it all on photonic chips that are compact and energy efficient. The team knew that the lower the optical loss in the silicon nitride waveguides, the lower the laser power needed to generate a frequency comb. "Figuring out how to eliminate most of the loss in silicon nitride took years of work from many students in our group," says Michal Lipson, Eugene Higgins Professor of Electrical Engineering, professor of applied physics, and co-leader of the team. "Last year we demonstrated that we could reproducibly achieve very transparent low-loss waveguides. This work was key to reducing the power needed to generate a frequency comb on-chip, which we show in this new paper." "We actually placed the microresonator directly at the edge of the laser cavity so that this reflection made the ring act just like one of the laser's mirrors—the reflection helped to keep the laser perfectly aligned," says Brian Stern, the study's lead author who conducted the work as a doctoral student in Lipson's group. "So, rather than using a standard external laser to pump the frequency comb in a separate microresonator, we now have the freedom to design the laser so that we can make the laser and resonator interact in new ways." All of the optics fit in a millimeter-scale area and the researchers say that their novel device is so efficient that even a common AAA battery can power it. "Its compact size and low power requirements open the door to developing portable frequency comb devices," says Alexander Gaeta, Rickey Professor of Applied Physics and of Materials Science and team co-leader. "They could be used for ultra-precise optical clocks, for laser radar /LIDAR in autonomous cars, or for spectroscopy to sense biological or environmental markers. We are bringing frequency combs from table-top lab experiments closer to portable, or even wearable, devices." The study is titled "Battery-operated integrated frequency comb generator." 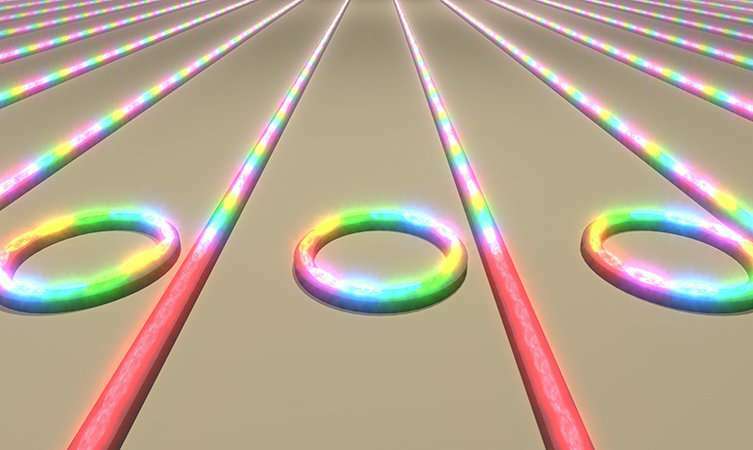 Optical Resonating Rings necessary for Quantum Holographic Optical Data Storage Future. The use of names, that don't mean anything, just used for funding and razzle dazzle, never created optical storage. Now we're training people w/ the same story that was sold for funding over 50 years ago. Got a Nobel, dis'd women, made education impossible, created Wrinkle in Time, while defying Logic. A rock has Billions of years of information stored; yet we can't find it. Why, it ain't Quantum? Som'n the Idiot Trump tried to find, evidence of a lie. Well maybe it ain't a lie. It's possible? No? Originally code use a fixed memory stack, If Quantum, or nonsense, the QM filter would be an input/transformation/output, No moving parts; therefore, Robust. Something like talking to a Rock, only a finite number of responses for a given input. That's QM, the search for the transformation including the search for the Right Rock! It'll work; but, it'll take forever! Input=Frequency.Domain, Output = "whatever" How? An Easter. Egg.Hunt! You know, every charge complies! How ya got 'em lined up? No really, how are the centers arranged. See, they don't all see the same Field at the same time. Dont worry 'bout it, once you do an arrangement, you have som'n you can cut and paste. It ain't garbage. Just be reasonable, we can make everybody Rich! Those wavelets or "Quantums" don't jump out of nowhere, every field has an origin. See, charge. See charge run.